So I made a bliaut this week.Yep. This happened. I’m sure readers are wondering why a woman, who is normally focused on the clothing of Rome and Byzantium, is now making Norman garb. Well, for one, I’ve wanted one for a long time. For twos, my persona is half-Norman. My boyfriend is Norman, and the freehold I am apart of is a Norman keep. 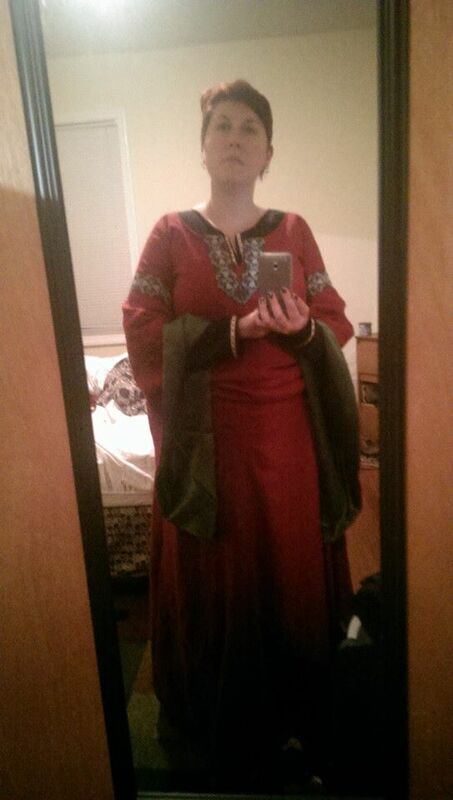 So…it was only a matter of time before I made Norman garb for myself. My friends in the neighboring barony are being invested as baron and baroness this coming weekend, and they are Saxon. So, what could be funnier than all of their pals showing up as Normans to the party? Our area 12th Night event is also very early 12th century and traditionally a 10 foot rule event, so I needed to make something appropriate for that, also. The only hitch was that I’m 11th Century, 1090s to be exact, so I had to find evidence to support the wearing of this garment in that period. That was relatively easy, as the Bayeux Tapestry clearly shows women wearing snug dresses with droopy sleeves. Tada! I found the spot of evidence I needed from Sarah Doyle’s Page on The Clothing of Norman Women in the Late 11th and Early 12th Centuries. She gives a wealth of sources that made it easy to get an idea of the style I wanted to make, as bliauts can vary quite a bit. I wanted to keep it relatively simple with sleeves a reasonable length such as Aelfgyva’s above, and line then to show contrast as what seemed popular during this period. The only other real issue I had was determining a neckline, and I went with the keyhole rather than the V-Neck. It will be mostly covered by my veil anyway. The process didn’t take too long. I made an underdress out of black linen and 4 gores. I threw some trim on the neckline, cuffs and bottom hem. The main gown is made from a deep red linen, that also has 4 gores and cut-out underarms to allow for the easier attaching of the sleeves. 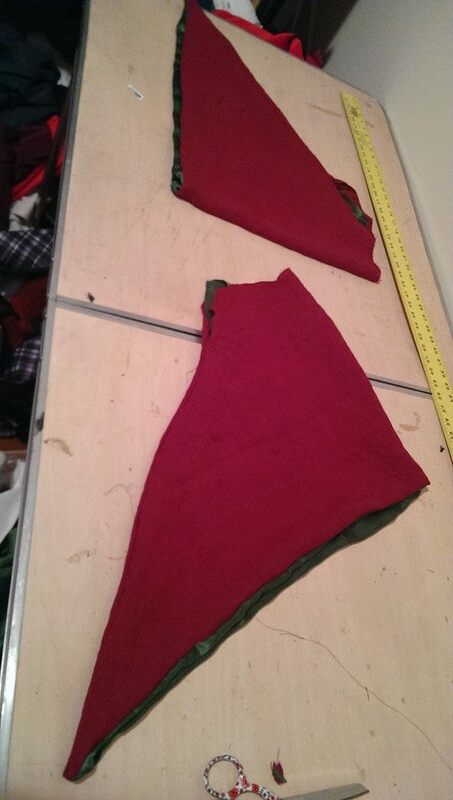 The sleeves were really the most tedious part, but still not difficult. Linings don’t scare me, but I ran into some hiccups as far as being able to ensure the hiding of seams but still closing a side seam up after the sleeves were inserted. 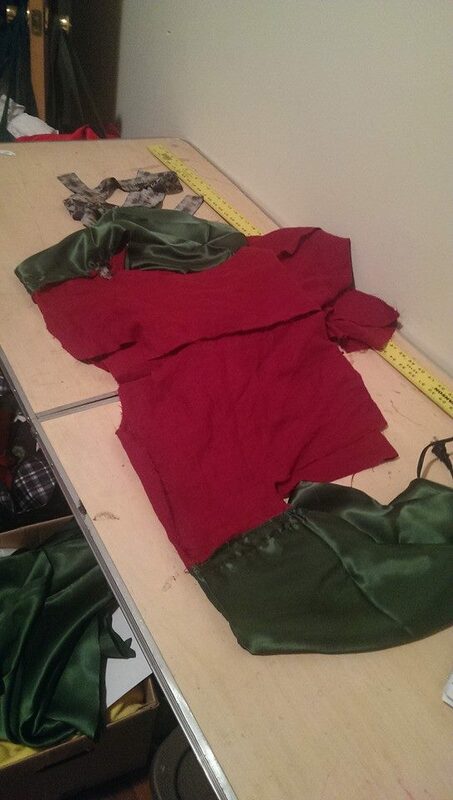 So I basically had to partially complete the sleeves and then leave about 5-6 inches unsewn so I could attach it to the main body of the dress. Easy enough. 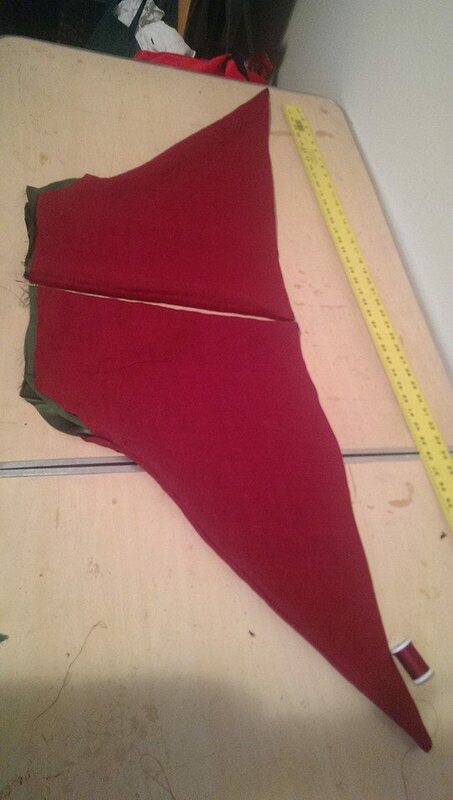 Under normal circumstances I would have sewn just the linen together and then finished the green silk lining over the seam by hand, but it was fighting back and some points weren’t matching as well as I planned them too, SO, the silk got machined into the seam and finished with a zig zag. This makes me worry a bit about fraying, but it was the best option given the circumstances, and that I decided to make this 3 days before wearing it. More on that later. Here’s some pictures of the sleeve process. Attached to the body. There’s also trim on the outside, which I should have waited to do by hand. 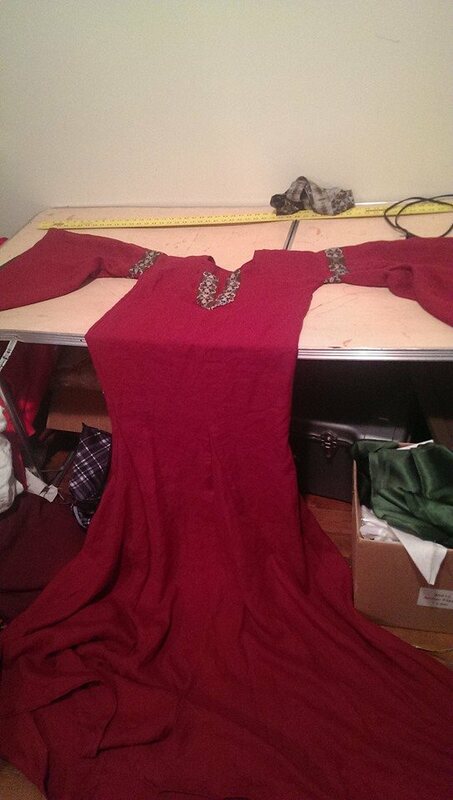 Once the sleeves were on, the dress came together much faster. All I had to do at this point was finish the trim on the neckline, sew on the side gores and then close the sides. The dress itself is a foot longer in the torso than a normal tunic dress, this allows for the ruching look that was desirable during the period. I opted to not lace the side of the dress. This results in some interesting shimmy shimmy shakes to take it off, since I had to take in the sides to make it tight enough. I told you. Long dress is long. This is what it looked like before I shaped the side seams. And here’s a snapshot of my first test fitting before taking in the sides. I pulled in the sides a bit more after this, and made the girdle out of the leftover trim I had. The only REAL mistake I did was attaching the trim on the upper arm before sewing the side seam. This sounded like a great idea at the time, but they don’t match up, which you can kind of see if you’re standing behind me. I expect to hear some crap about that this weekend. So I figure once the event is over, I can go and remove the trim, and replace it by hand so I don’t have that problem. I’m still not sure why my measurements are off. ‹ PreviousThe Providence Street Painting Festival! Look what I did!